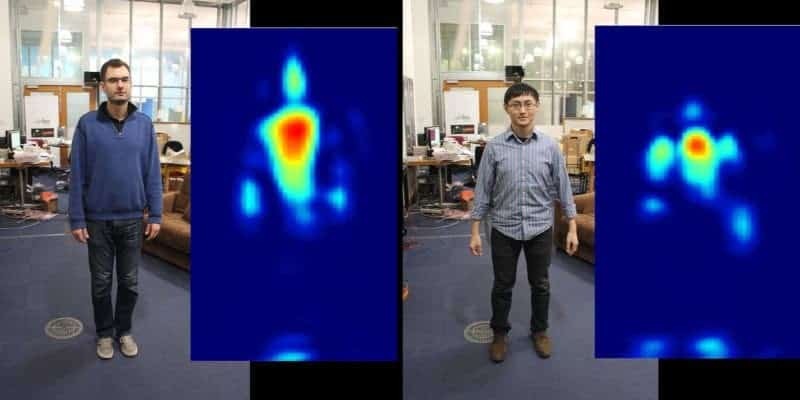 Researchers at MIT have developed a device that can track human silhouettes behind walls using Wi-Fi. The device called RF-Capture emits out Wi-Fi signals and then tracks back the reflections and see if together, they piece a human form. This is what the RF-Capture “sees”. Note that it only detects some parts of the human body. Image credits: MIT. Wi-Fi is a local area wireless computer networking technology that allows electronic devices to connect to each other, generally using the 2.4 gigahertz (12 cm) UHF and 5 gigahertz (6 cm) SHF ISM radio bands. But Wi-Fi can do more than create networks and connecting you to the internet – as a new study just showed, it can send out a signal and reconstruct what’s “on the other side” – see what reflected the signal back. This can generally be done with every type of wave, but high frequency waves provide better resolution and Wi-Fi is a cheap and generally available technology, which makes it more attractive to use. How it works. Image via MIT. The sensibility is absolutely amazing! Being able to detect movements with the same accuracy as a kinect camera placed right in front of the subject is absolutely spectacular. The concept itself is not new – it’s something that has been used in geophysics for decades, for example in ground penetrating radars, a technology that can detect buried near-surface objects. But the application is entirely different, and holds a lot of potential, because Wi-Fi is basically ubiquitous in the developed world.